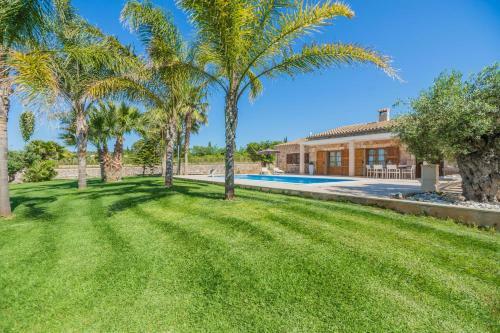 Villa Muro Garden in Muro is a holiday home with 1 room. Featuring a private swimming pool and a garden with barbecue facilities, Villa Muro Garden is located in Muro. The nearest beach is 12 minutes’ drive from the property. 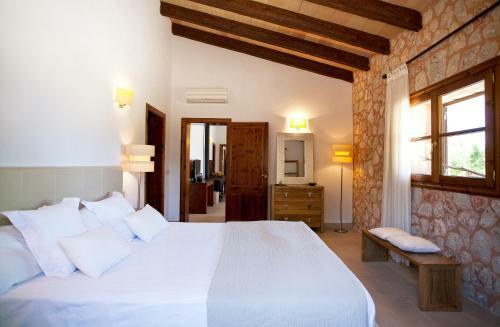 This stylish, air conditioned villa offers wood-beamed ceilings throughout, and has 2 double bedrooms and 1 twin bedroom. There are 2 bathrooms, each including a shower and a hairdryer. Bed linen and towels are provided. The bright and spacious living area includes a set of sofas, a flat-screen TV with satellite channels, and a d...ining table. You will find a washing machine, oven, dishwasher, microwave, and electric kettle in the well-equipped kitchen. Free WiFi is available free of charge. Activities such as hiking, horse riding, cycling, and golfing can be done in the surroundings. A 15-minute drive takes you to Can Picafort, where you can find a variety of bars and restaurants. Palma de Mallorca Airport is 55 km from Villa Muro Garden. Featuring a private swimming pool and a garden with barbecue facilities, Villa Muro Garden is located in Muro. The nearest beach is 12 minutes’ drive ...from the property. 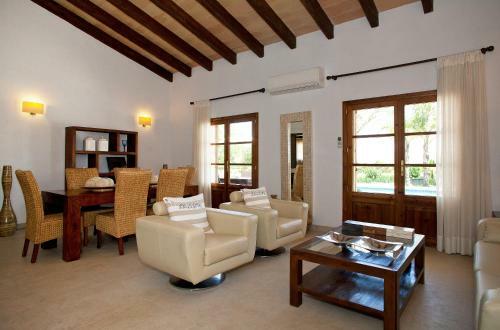 This stylish, air conditioned villa offers wood-beamed ceilings throughout, and has 2 double bedrooms and 1 twin bedroom. There are 2 bathrooms, each including a shower and a hairdryer. Bed linen and towels are provided. The bright and spacious living area includes a set of sofas, a flat-screen TV with satellite channels, and a dining table. You will find a washing machine, oven, dishwasher, microwave, and electric kettle in the well-equipped kitchen. Free WiFi is available free of charge. Activities such as hiking, horse riding, cycling, and golfing can be done in the surroundings. A 15-minute drive takes you to Can Picafort, where you can find a variety of bars and restaurants. Palma de Mallorca Airport is 55 km from Villa Muro Garden. When would you like to stay at Villa Muro Garden? Please inform Villa Muro Garden in advance of your expected arrival time. You can use the Special Requests box when booking, or contact the property directly with the contact details provided in your confirmation. This property will not accommodate hen, stag or similar parties. A damage deposit of EUR 300 is required on arrival. This will be collected as a cash payment. You should be reimbursed on check-out. Your deposit will be refunded in full in cash, subject to an inspection of the property. Please note, satellite TV is available in Spanish and German.